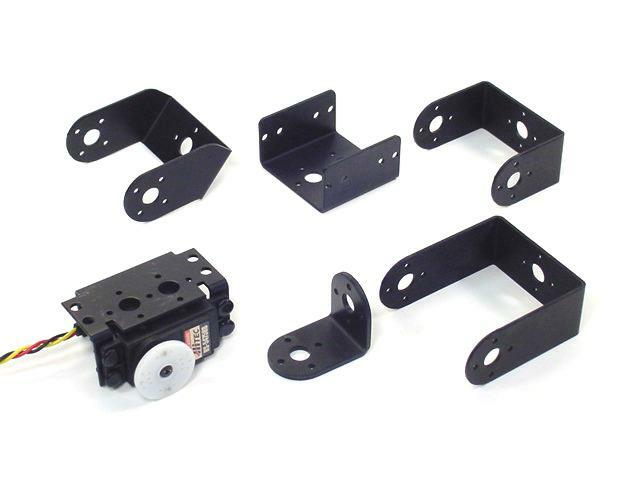 The assembly guides include parts lists to help you know which parts to order. 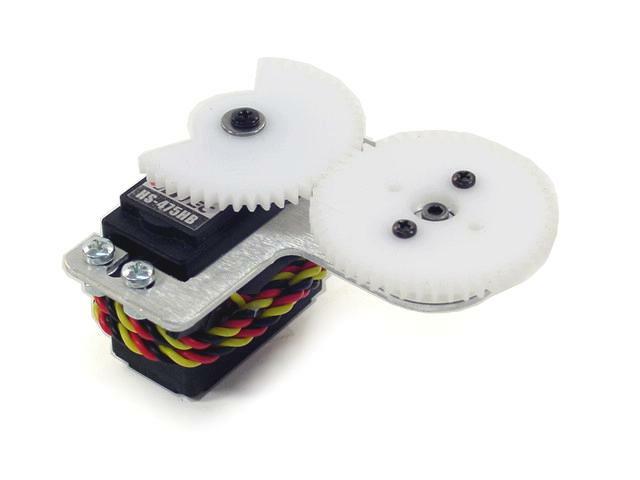 Please send .jpg images of your robotic creations to the webmaster for inclusion in our gallery. 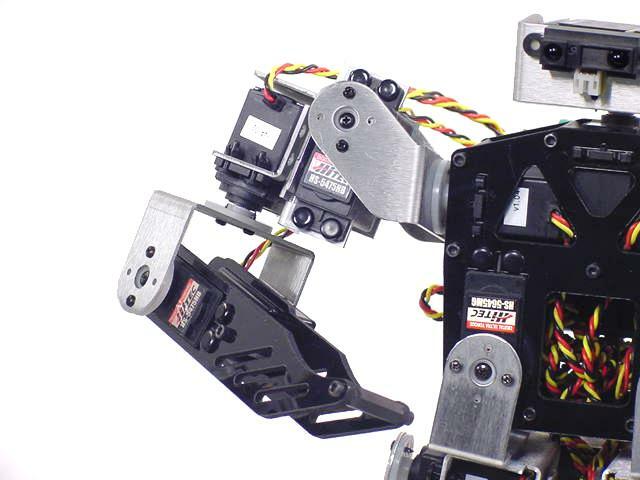 This page puts together all sub-assembly guides relevant to the Servo Erector Set V1.1 construction kit, including the BRAT biped, AL5D arm, MH2 hexapod, SQ3 quadruped and 2WD rover. 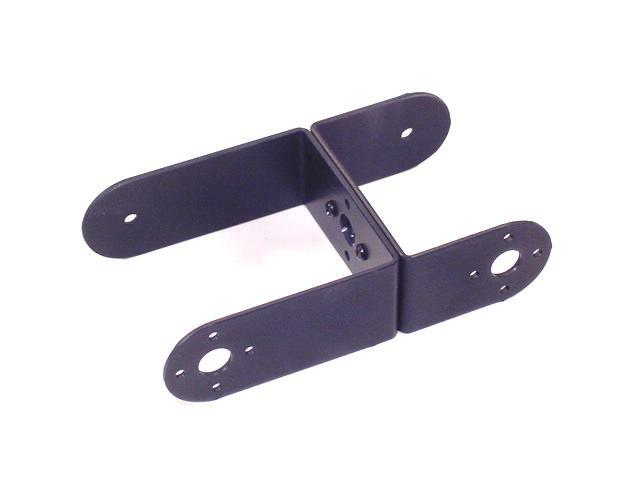 These are the basic assembly instructions for the Multi Purpose Bracket (ASB-04), and any of the "C" brackets. It's just a starting point. There are dozens of combinations for assembly. 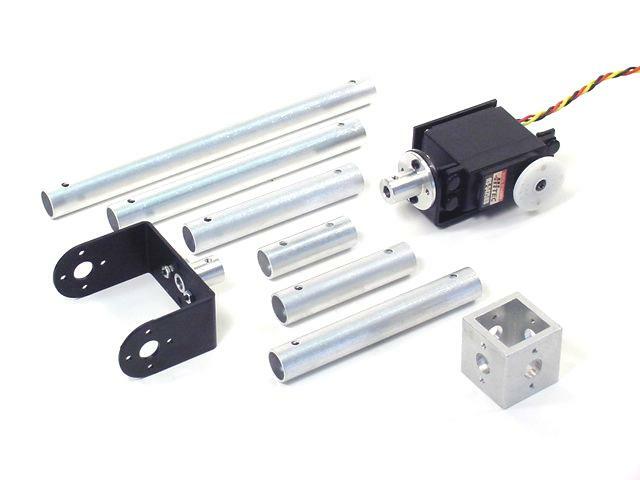 These are the basic assembly instructions for the Tubing, Hubs, and Hub Connectors. It's just a starting point. There are dozens of combinations for assembly. 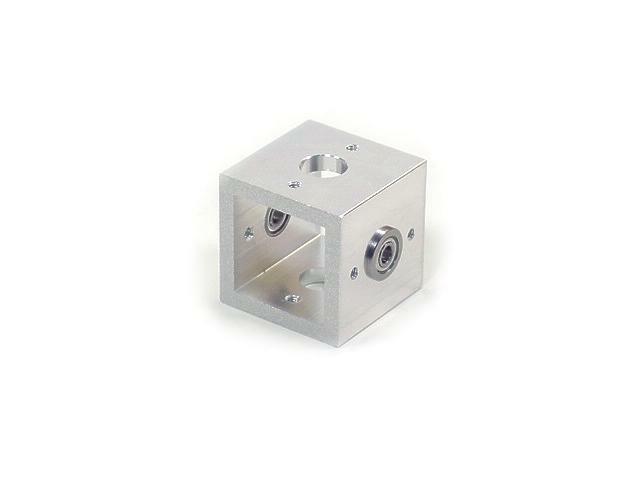 Low Profile Axis and Ball Bearing Hub. 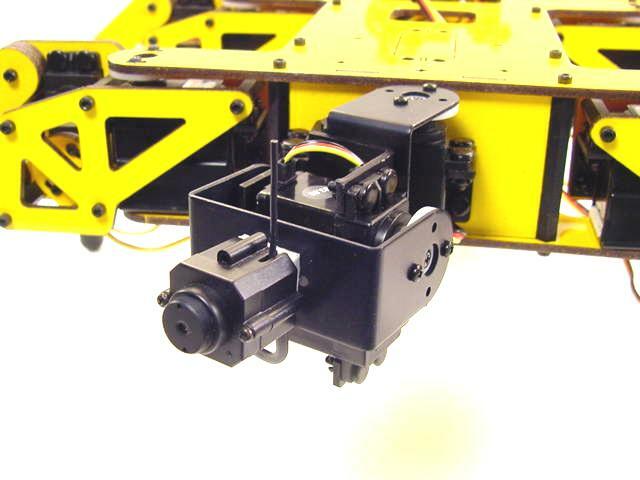 These are the basic assembly instructions for the Low Profile Axis (LPA-01). It's just a starting point. There are dozens of combinations for assembly. 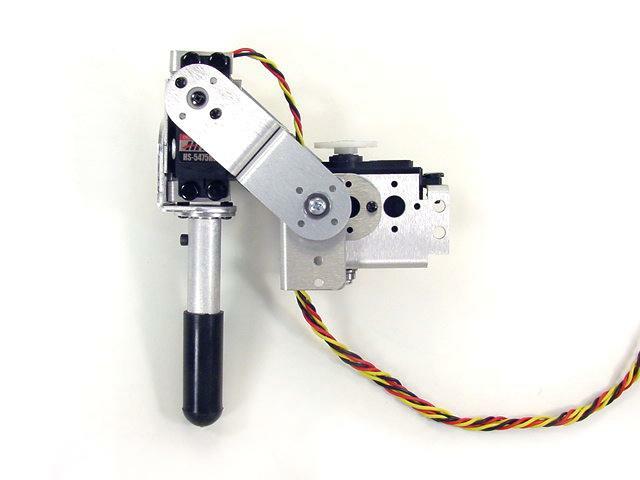 This arm measures 6" between each axis. 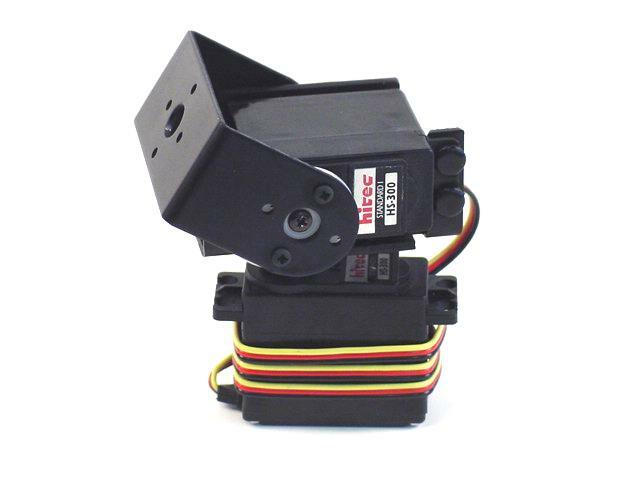 It can be controlled from our RIOS SSC-32 software. The L5 and L6 tutorials still apply. 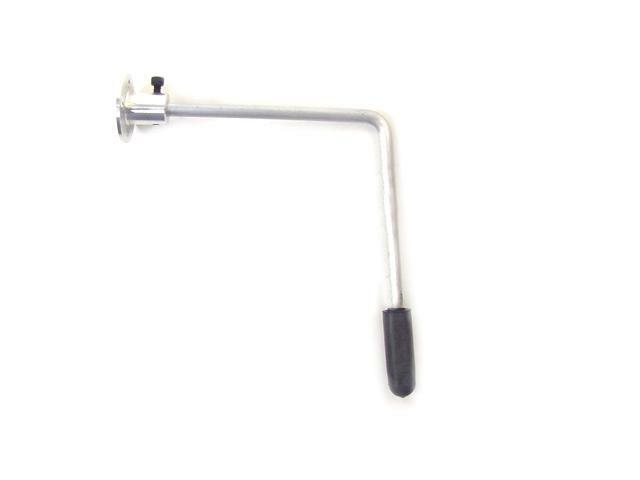 Perfect for Aluminum Tubing arms. 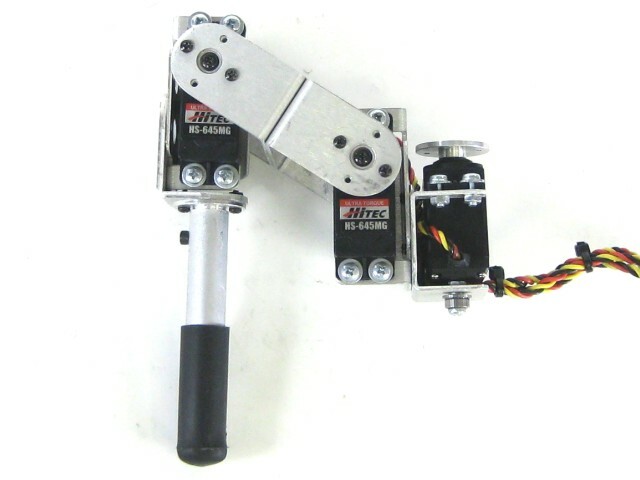 This is an example of a simple arm made with the set. 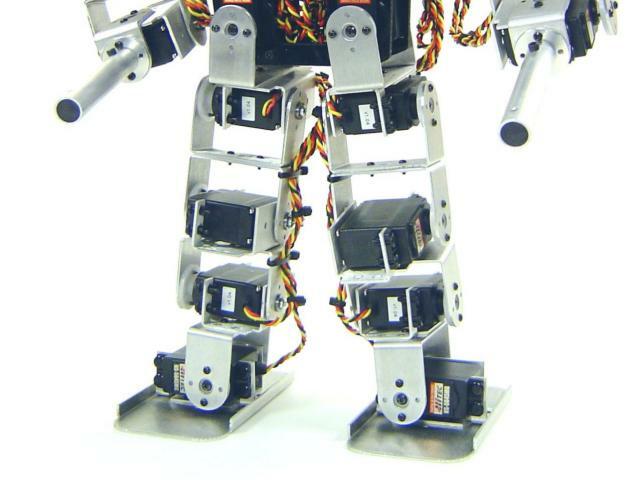 This is one configuration for a Robo-One style humanoid biped. 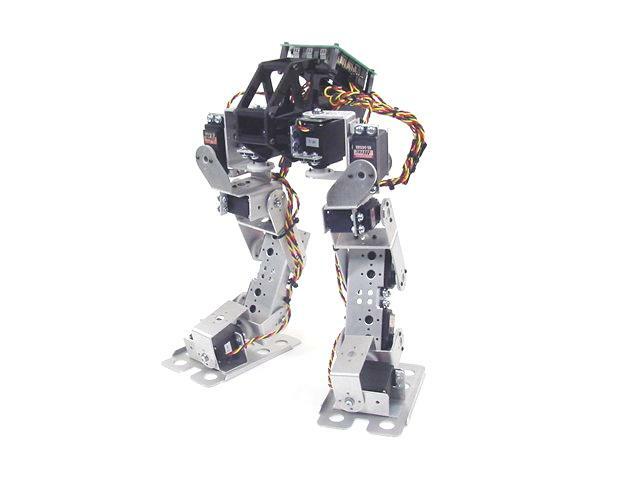 This uses the Biped Torso A and servo brackets. 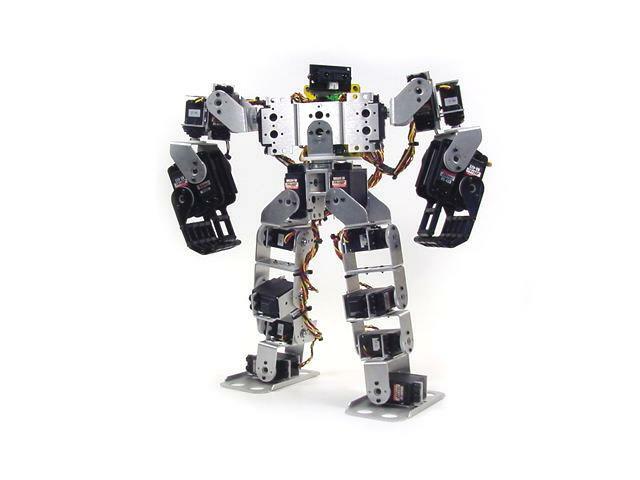 Prototype Humanoid Biped with Waist Rotate. 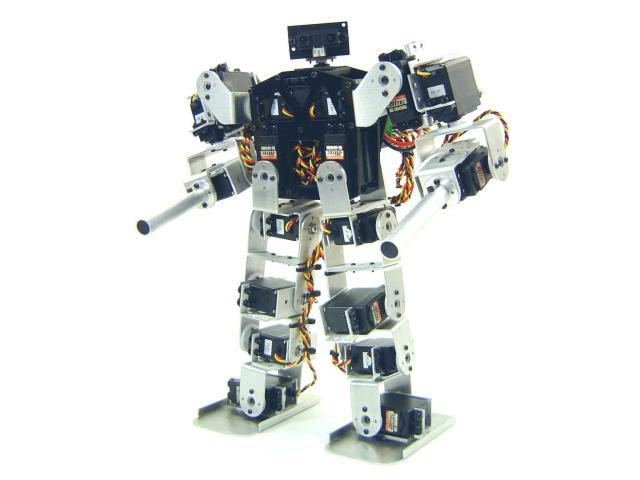 This is a prototype for a Robo-One style humanoid biped with waist rotate. This is an example of a 5DOF leg made with the set. 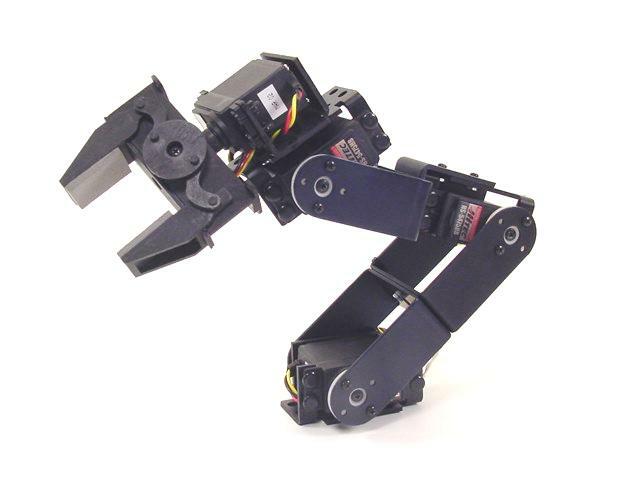 This is an example of a 4DOF arm made with the set. 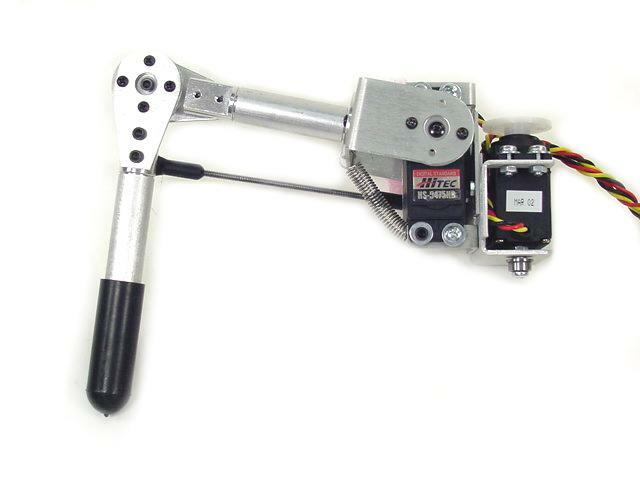 This uses the Robot Hand A and servo brackets. 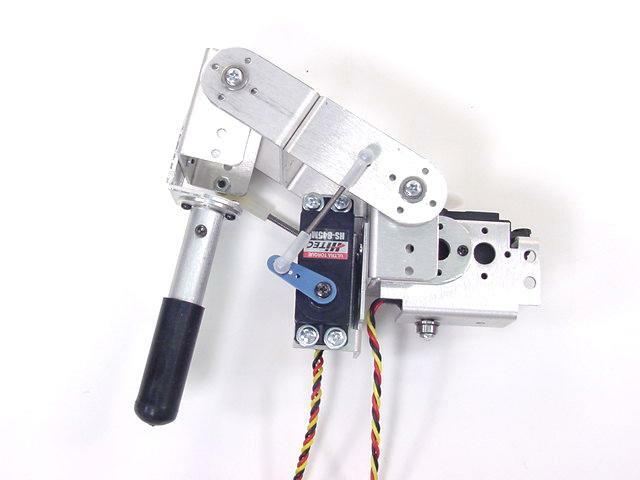 This uses the Robot Hand B and servo brackets. This is an example of a 6DOF leg made with the set. 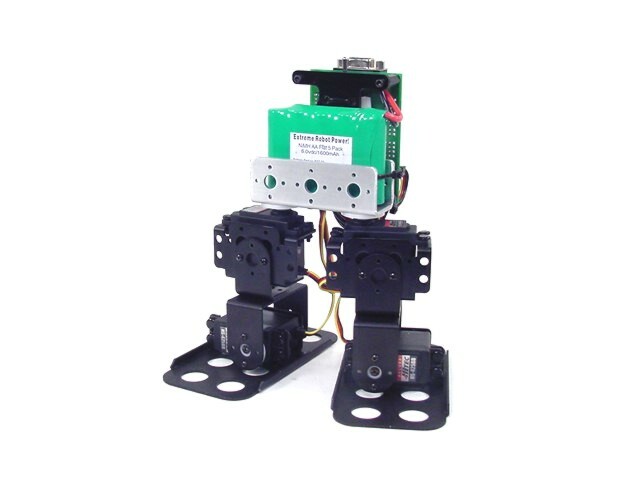 Our popular Biped Scout with aluminum legs made with the Servo Erector Set. 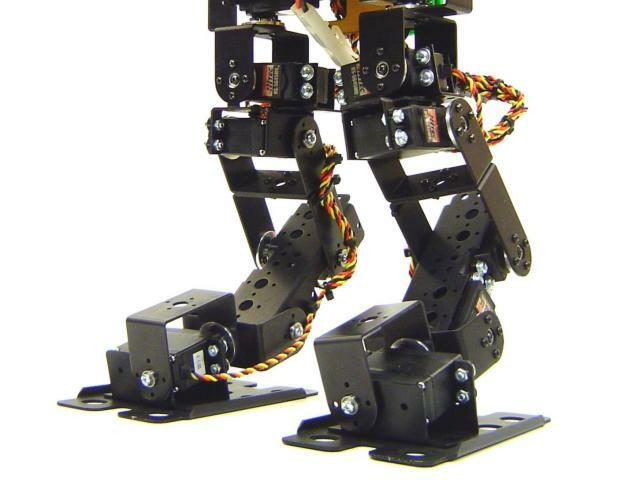 This is an example of a 6DOF biped made with the set. 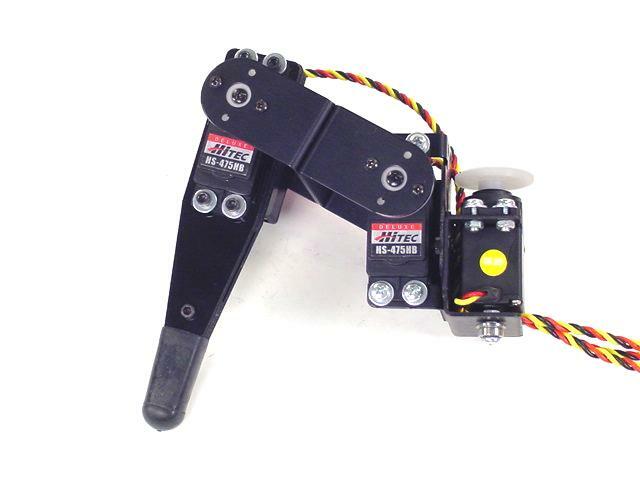 Our popular Biped BRAT made with the Servo Erector Set. 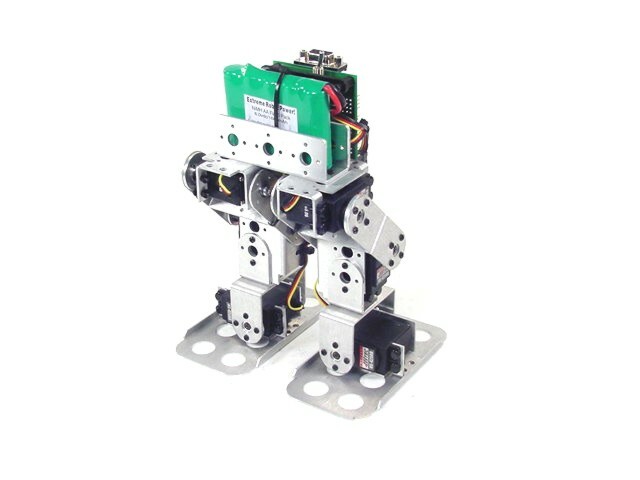 This is a 4-Servo biped, BRAT Jr. 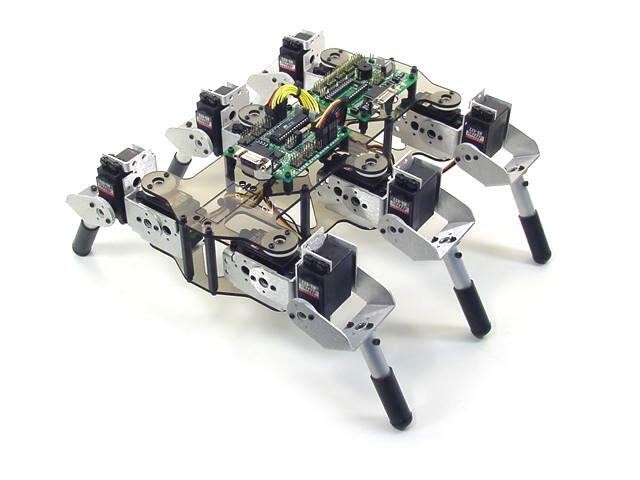 This cute hexapod measures 10.5" long and 12" wide. 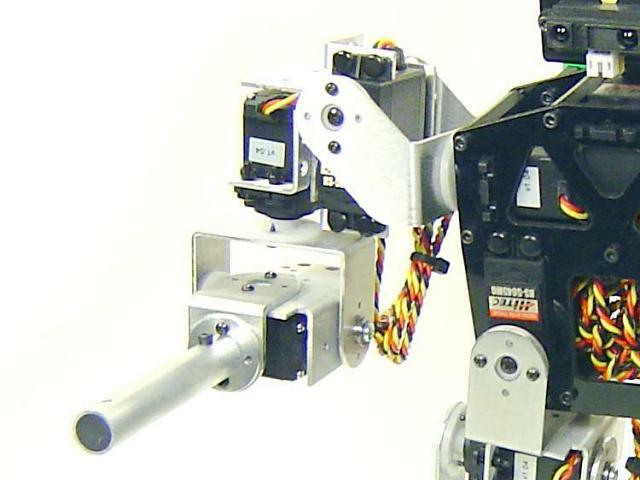 It supports the Bot Board and SSC-32. 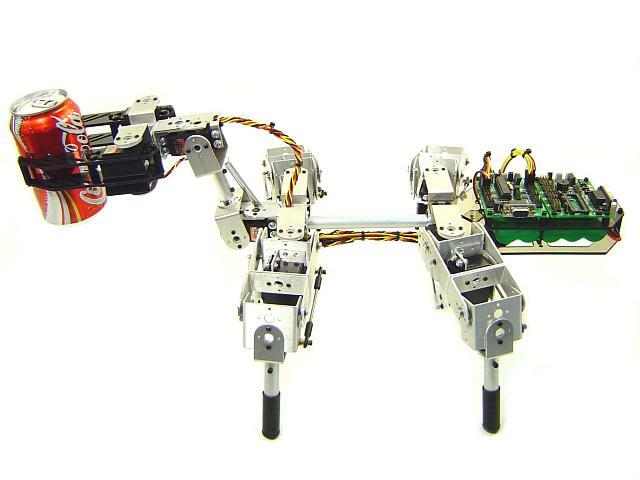 All EH2 tutorials apply to provide RC or autonomous operation. 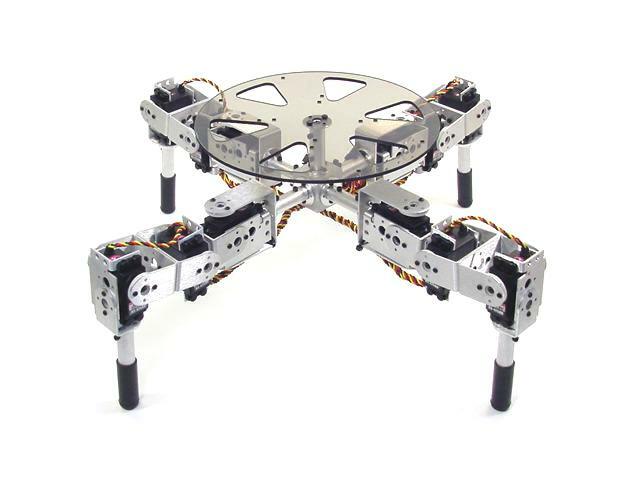 Same as above, but with aluminum chassis. 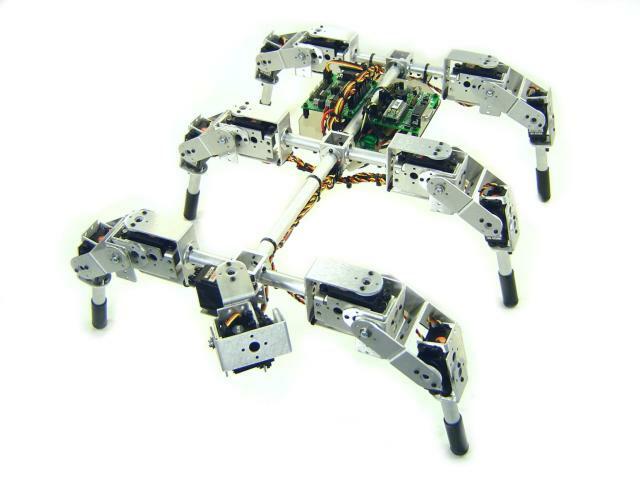 This hexapod measures 19.5" long and 15" wide. It supports the Bot Board and SSC-32. 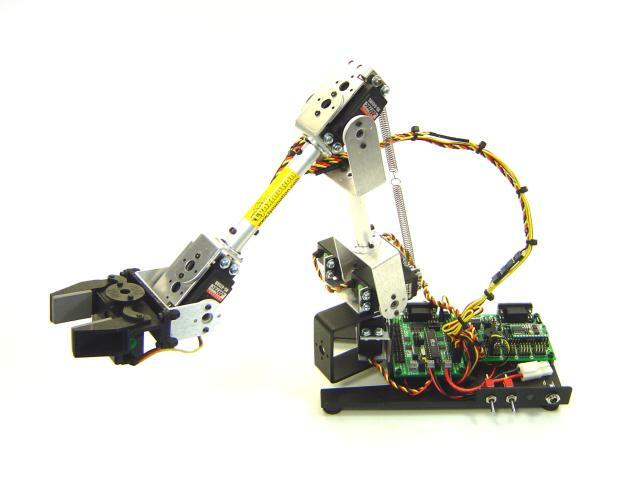 All EH2 tutorials apply to provide RC or autonomous operation. 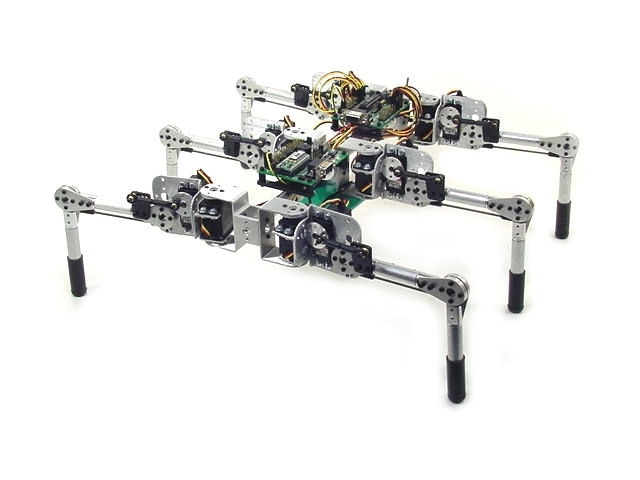 This hexapod uses the ASB-21 to create simple 2DOF legs. 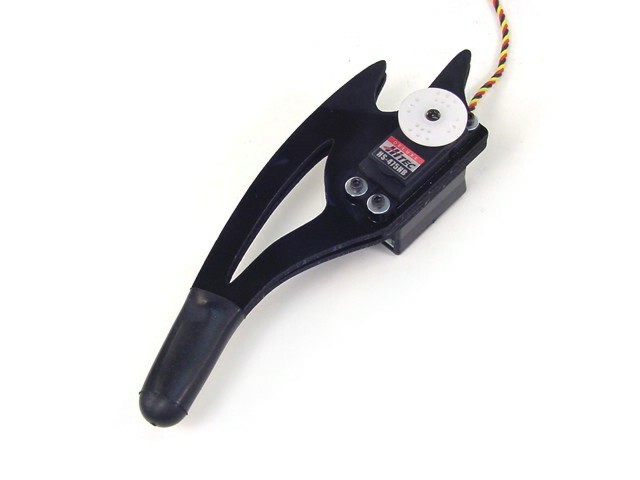 It measures 14.5" long and 16.5" wide. 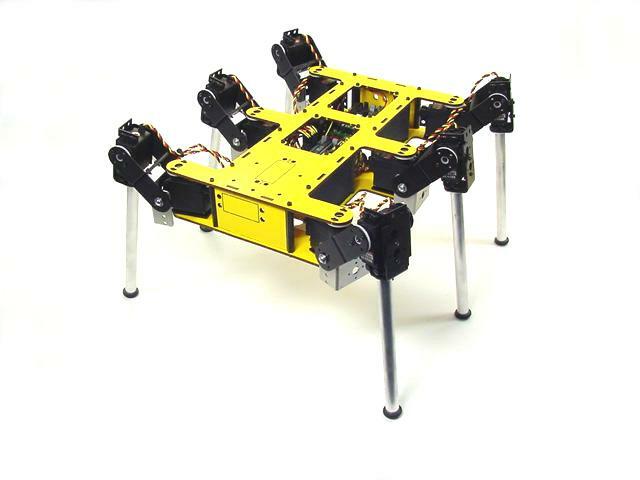 This full size hexapod measures 13" long and 15" wide. It supports the Bot Board and SSC-32. 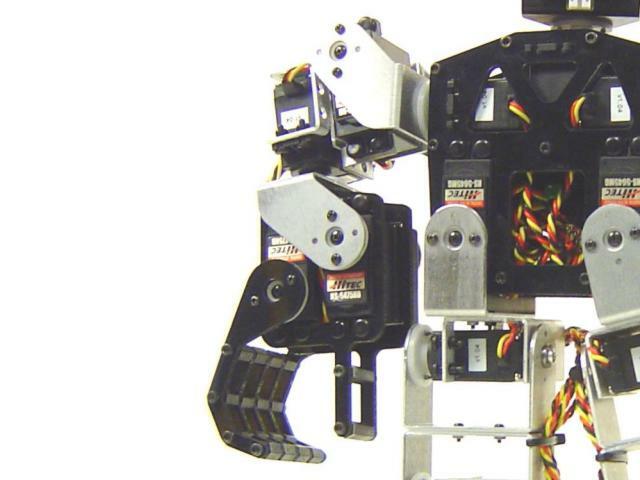 All EH2 tutorials apply to provide RC or autonomous operation. 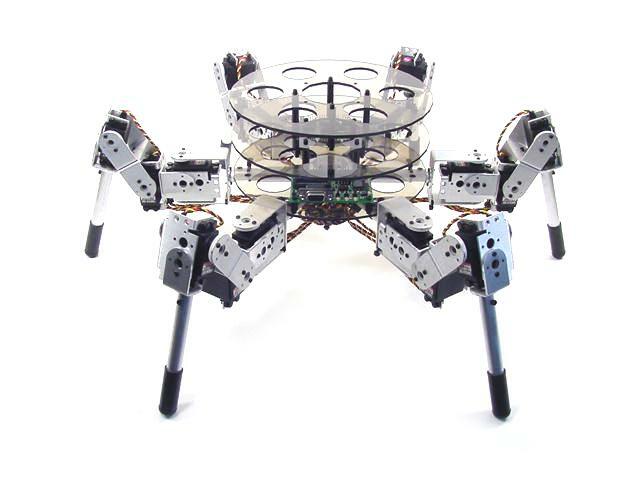 This full size round hexapod measures 18" in diameter. It supports the Bot Board and SSC-32. 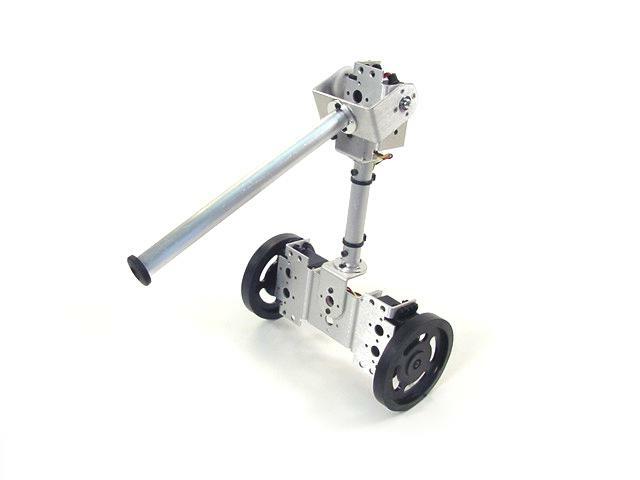 All EH3R tutorials apply to provide RC or autonomous operation. 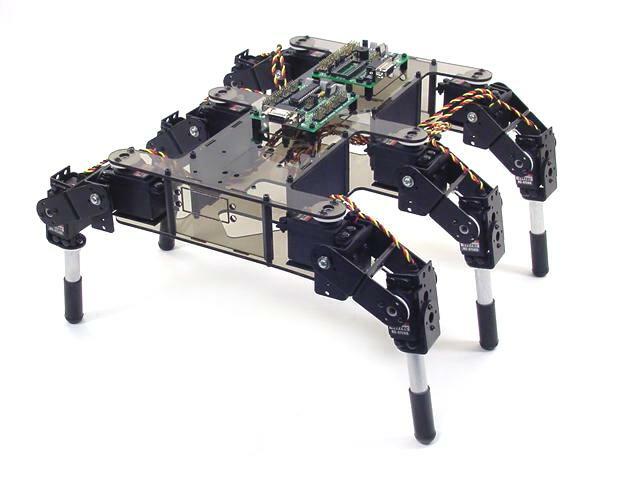 This full size hexapod measures 13" long and 15" wide. It supports the Bot Board and SSC-32. 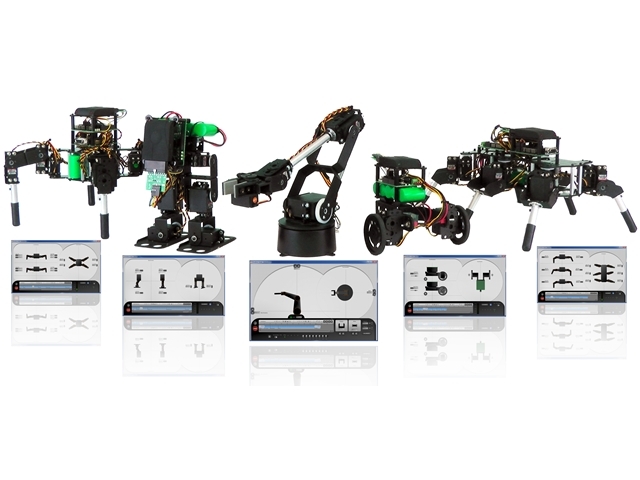 All EH2 tutorials apply to provide RC or autonomous operation. 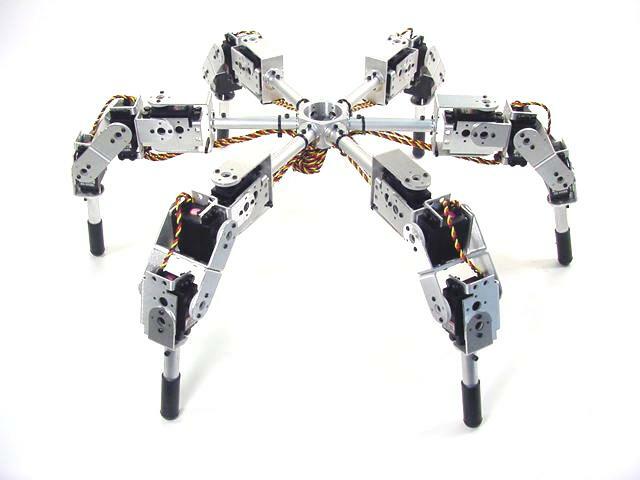 Note, this hexapod uses longer leg tubes than in the assembly. 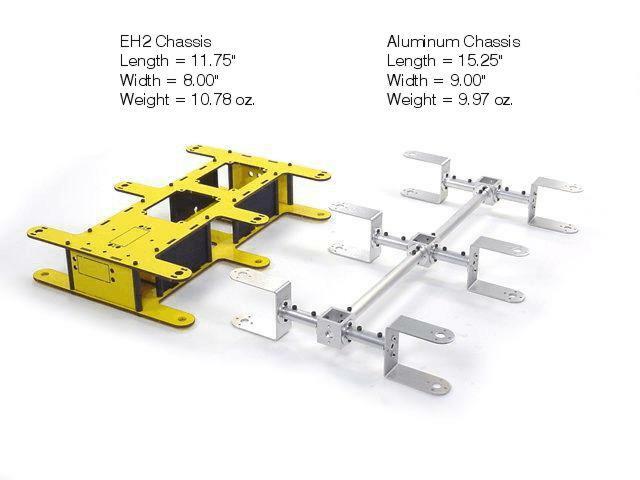 The chassis will be available soon. 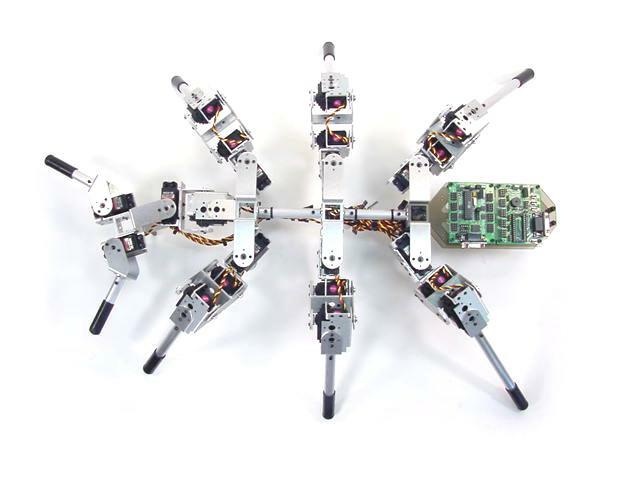 This circular hexapod measures 22" across. It supports the Bot Board and SSC-32. 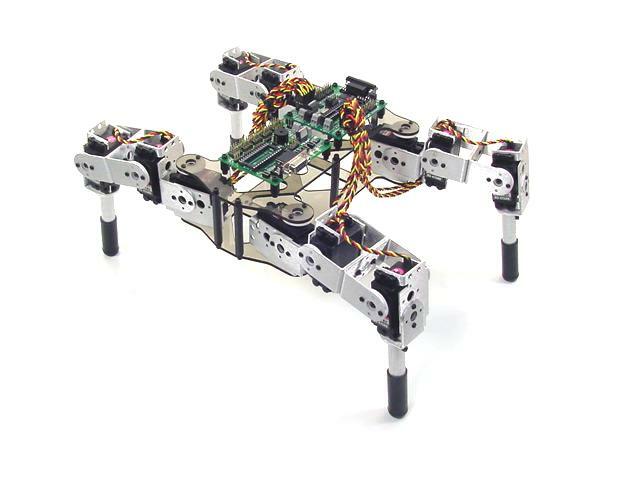 BASIC Atom programs in progress, any EH3R tutorials to provide RC or autonomous operation apply. 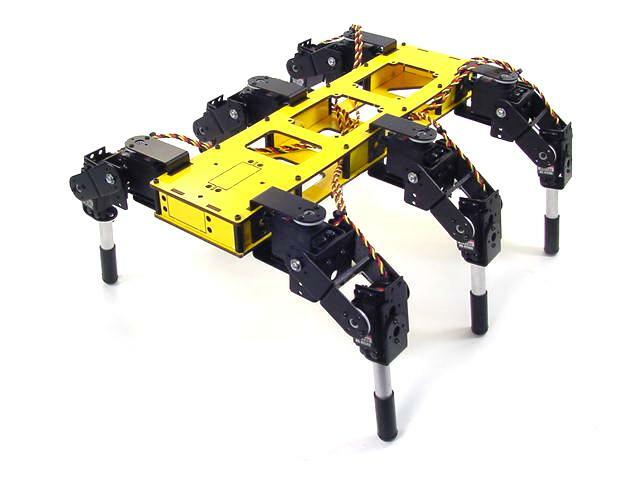 This awesome hexapod measures 26" long and 15" wide. It supports the Bot Board and SSC-32. BASIC Atom programs in progress. 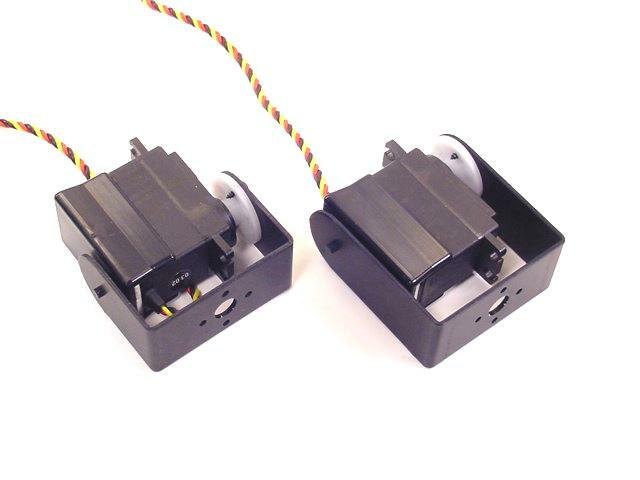 This cute little quadrapod measures 8.5" long and 15" wide. It supports the Bot Board and SSC-32. 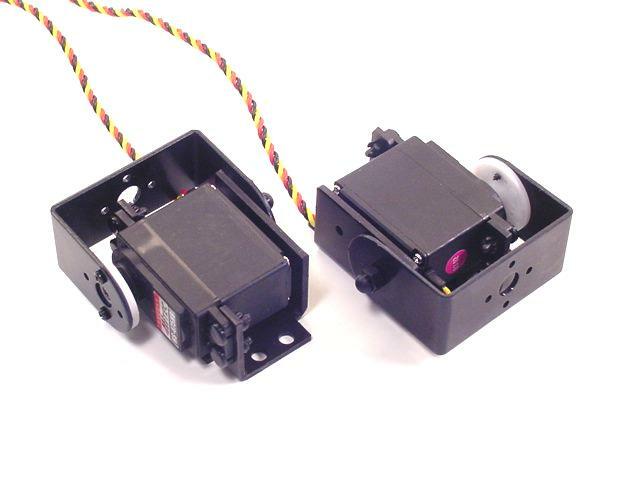 All EQP tutorials will apply to provide RC or autonomous operation when available. 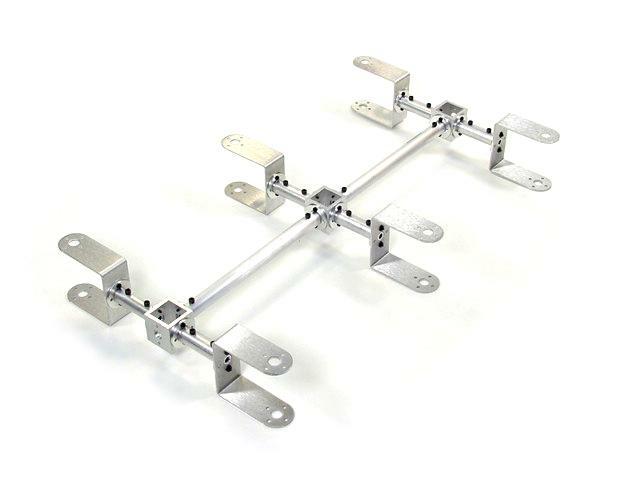 This cool quadrapod measures 18" across. 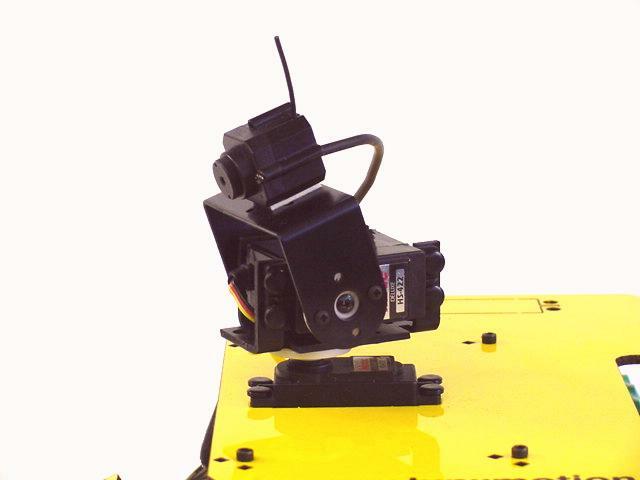 It features a round deck that can be stacked using tubing and hub connectors. 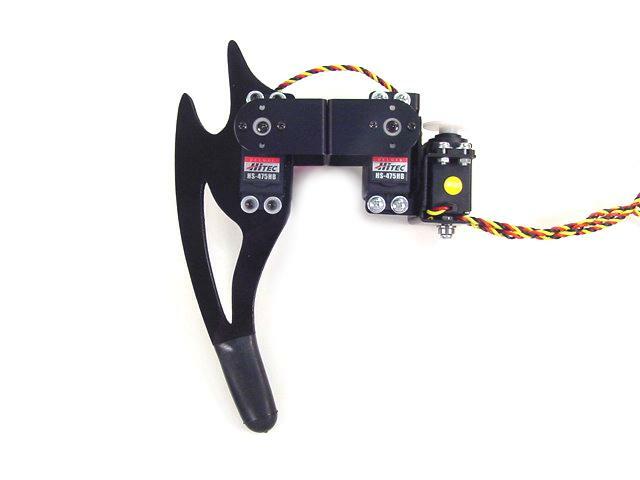 This awesome quadrapod measures 25" long and 15" wide, including the gripper. It supports the Bot Board and SSC-32. 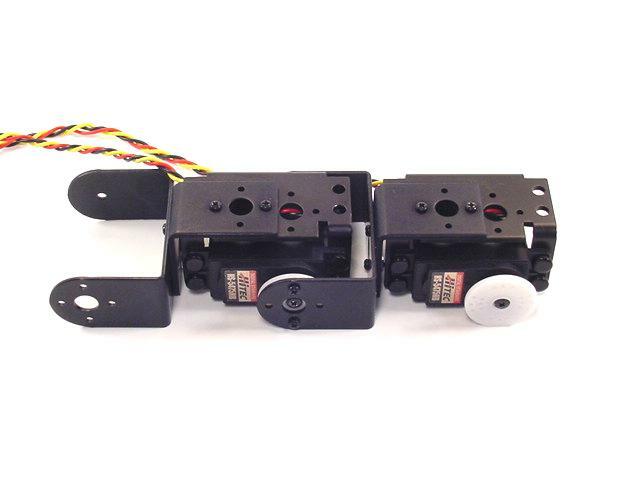 This leg tibia (knee to foot) is a redesign of the original tibia for our 3DOF legs. It's an affordable alternative to the SES tibia. Useful for 3DOF legs. 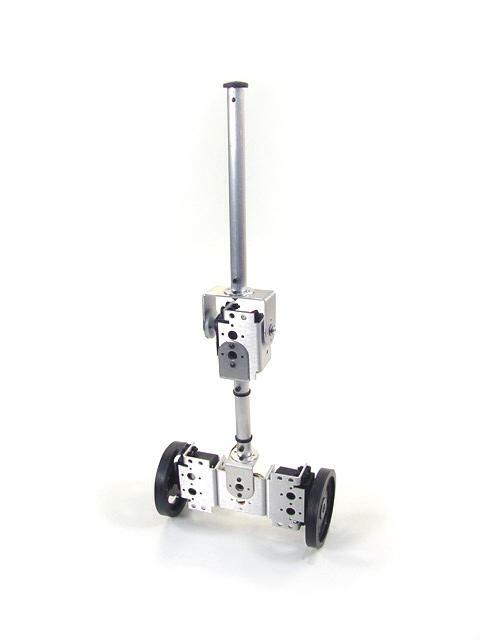 This leg tibia (knee to foot) is a stylish, affordable alternative to the SES tibia. Useful for 3DOF legs. 2DOF leg, Simple Single Fulcrum. This leg design is quite elegant in its simplicity. 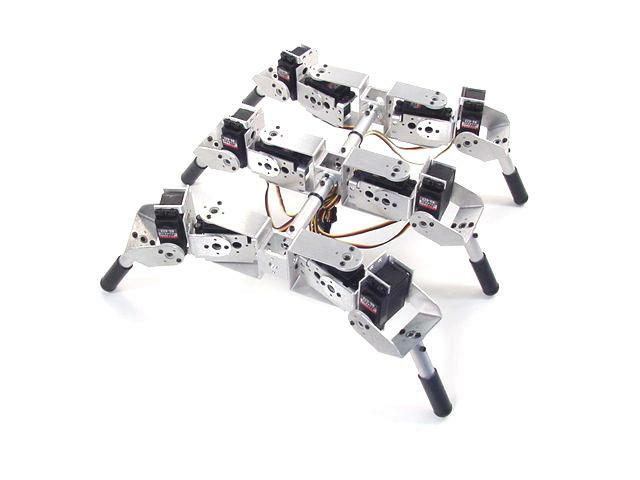 It's design was first seen on the MIT Genghis hexapod. 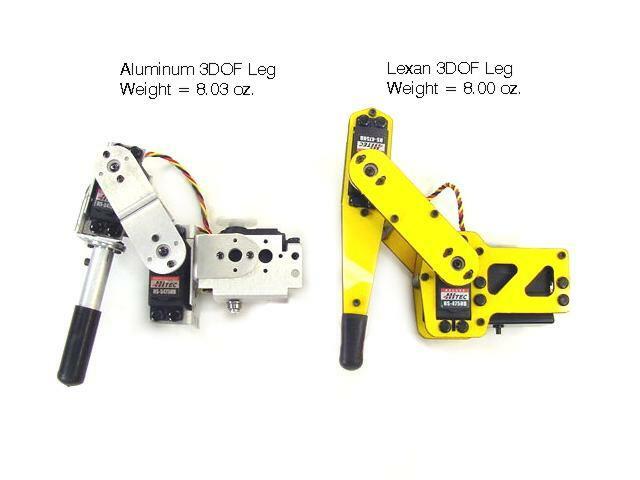 This leg design keeps the Tibia (knee to foot) at a constant angle. The angle can be adjusted by varying the length of a "dog bone" in the construction. Different lengths of tubing can be used. 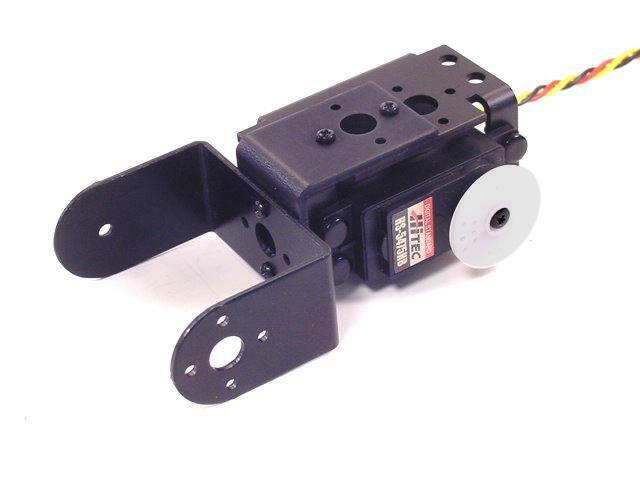 This leg design keeps the Tibia (knee to foot) at a constant angle. The angle can be adjusted by varying the length of a "dog bone" in the construction. It can be load balanced. 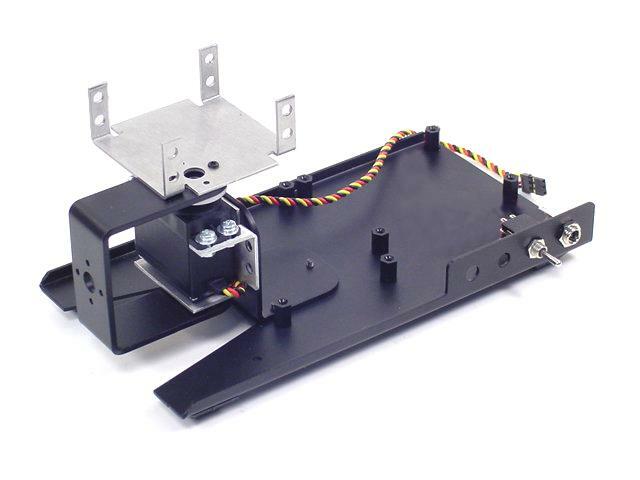 2DOF leg, Direct-Drive Parallelogram Pseudo 3rd DOF. 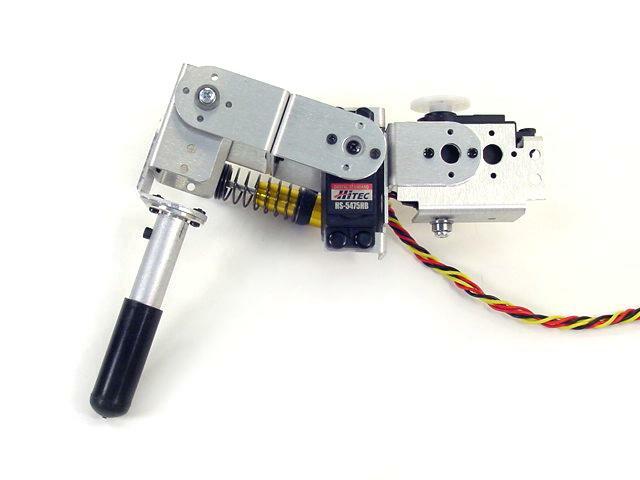 This unique leg design keeps the foot moving in a straight line even though the leg arrangement is moving through an arc. It can be load balanced. 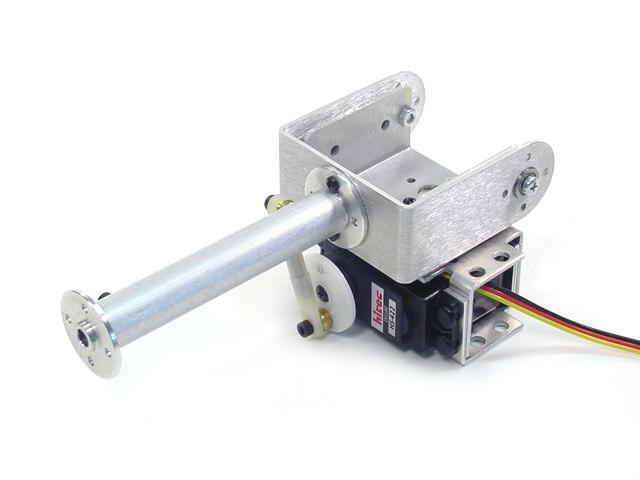 2DOF leg, Indirect Drive Parallel (Mechanical advantage). This leg design can hold a great amount of weight, but the tripod has to start and stop in the down position in the gait to be effective. It doesn't allow a variable ride height. 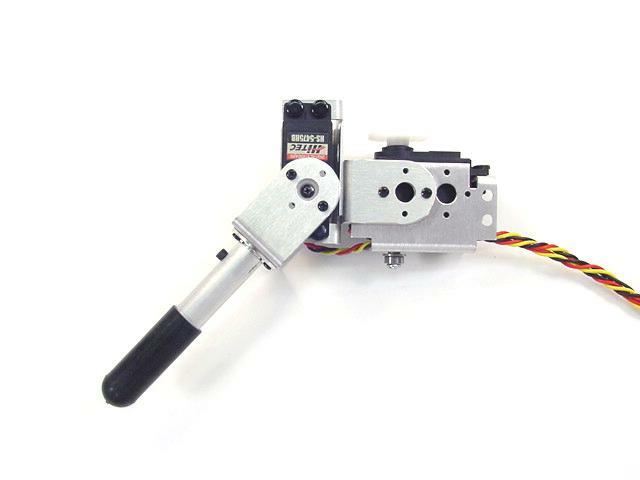 This is a very popular leg design. 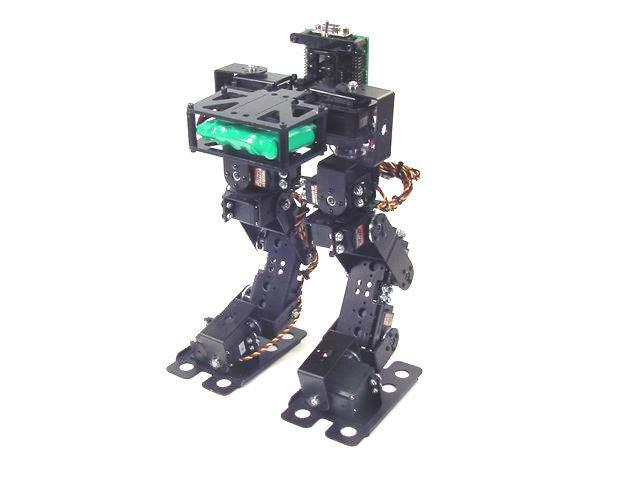 We have the Inverse Kinematics based BASIC Atom / SSC-32 code for this leg. 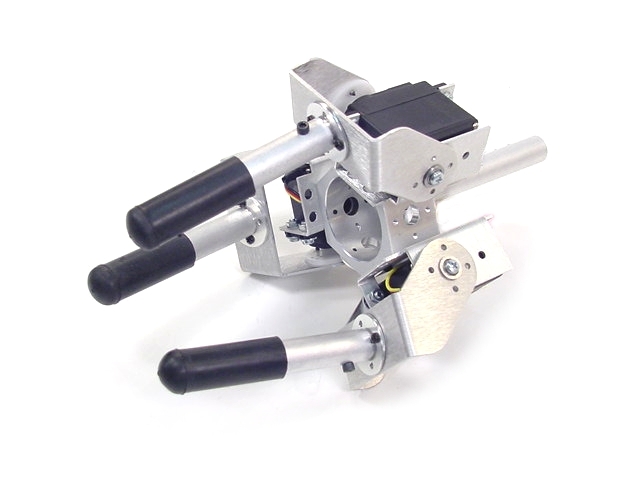 A multitude of legs or end effectors can be fabricated with standard 3/16" aluminum rod. 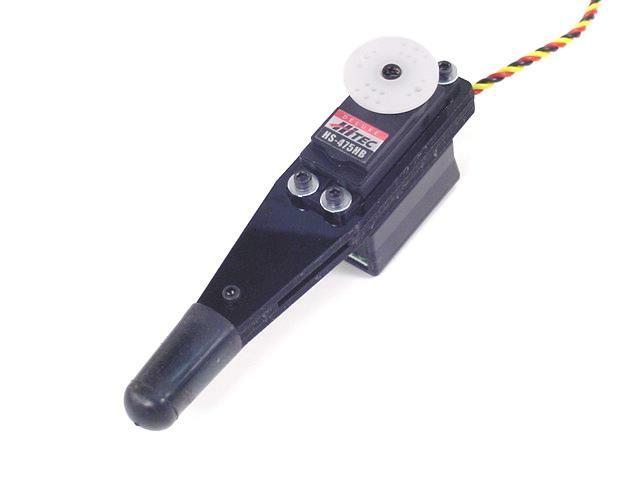 The AHC-01 can be used as a bearing block for mounting 1/8" or 3mm axels. 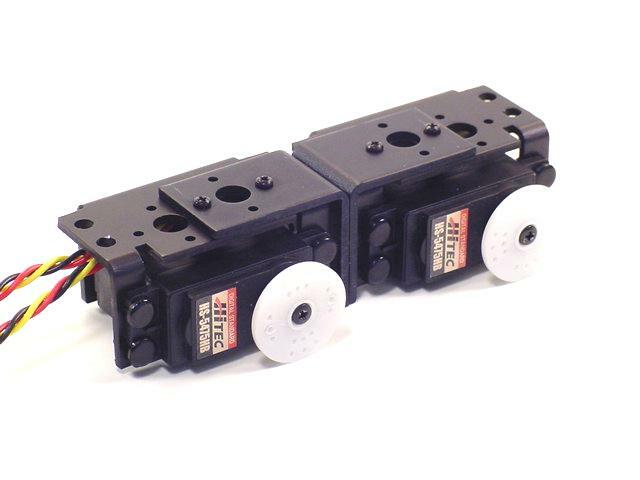 The bearings are available separately. Mechanical advantage joint. 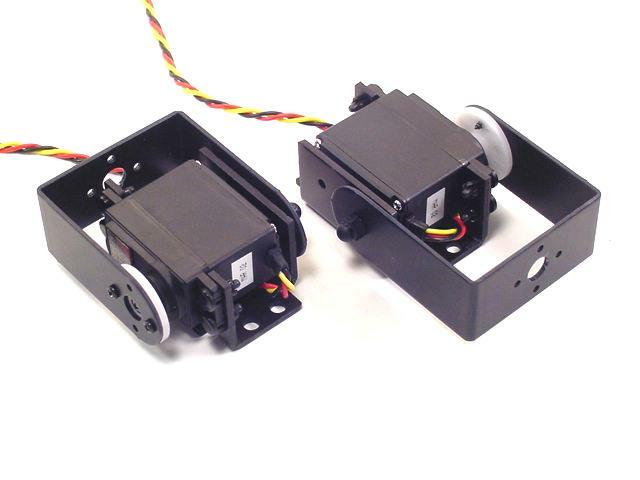 This illustrates how two ASB-04 brackets can be doubled on a servo for increased strength and or to allow connections to both sides of a servo.